音楽は平和の象徴。 Music is a symbol of peace. 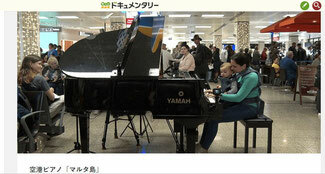 I watched a NHK BS TV program in which they video-recorded many travelers freely playing the piano installed in the Malta Island Airport with their comments after playing. This TV program was the most impressive one I had watched until now because of no pushy narration and BGM, which arrowed me to understand the video and the sounds as I liked in my own way. Music is a wonderful nonverbal international understanding tool.